In Health Clinic ⁄ Doctors ⁄ Chiropractor ⁄ Dr. Ly Ho, D.C.
About Dr. Ly Ho, D.C.
Dr. Ho did his undergraduate training at the University of Arizona where he earned Bachelor of Science degrees in Chemistry, BioChemistry and Bio-Molecular Chemistry. While pursuing a career in cancer research, Dr. Ho realized that he wanted something more. After a year traveling in Asia and experiencing “bone setters” and Chinese medicine, he decided to pursue a career in chiropractic. He attended Palmer College of Chiropractic West where he received the degree of Doctor of Chiropractic. From the U.S. to Poland to Morocco, Dr. Ho has used his knowledge to help people achieve their health and wellness goals. An athlete himself, Dr. Ho has an understanding and appreciation for athletes of all types, from the professional to the at-home endurance mom. His continuing thirst for knowledge keeps patients updated on the most healthful forms of exercise, training programs and diets designed to optimize one’s health. Whether you’re training for your first marathon or need more energy during your workday, Dr. Ho believes you deserve to feel your best. Dr. Ho provides health care to men and women suffering from pain associated with the hazards of their job, athletic endeavors or every day living. Injury to the body can occur while doing something as simple as bending down to pick up a pencil or as extreme as rock climbing in Yosemite. For most of us, injuries occur doing common everyday tasks like vacuuming, cooking, typing or traveling in the car. Being immobile can be just as harmful to the body as tripping and falling. Dr. Ho uses his knowledge of biomechanics and anatomy to restore health to hurting joints and muscles regardless of how the injury occurred. Because of his passion for running, Dr. Ho finds working with runners and triathletes especially rewarding, as he knows all too well the injuries that can go along with these sports. His patient/athletes achieve tremendous benefit from his gait and movement evaluations which can determine how movements can be modified to decrease the chance of re-injury and pain. Dr. Ho’s training in Graston Technique, Kinesio Taping, rehabilitative exercise and soft-tissue work, compliment his chiropractic adjustments and get patients back in the game. 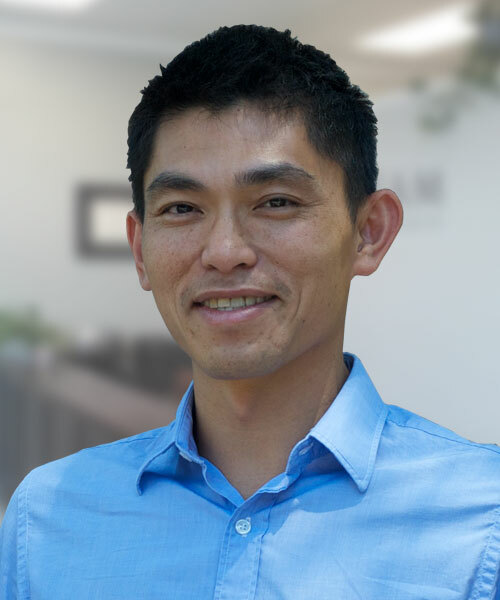 Dr. Ho has also trained in Activator Method, sports medicine, restorative medicine, rehabilitation, as well as nutritional and supplemental sports enhancement. He is associated with the California Chiropractic Association, TRIBE (the Los Gatos Triathlon group) as well as doing out -reach to local teens who are unable to afford care.